This page is where you'll find all the newspaper and magazine coverage of my MS campaigning activities. It's updated regularly, so be sure to check back often! Kaz Aston is delighted to share that a variety of public relations & charity events will be organised again for 2016. New supportes have kindly offered a range of activities to help with our education MS events and improve our online digital communication softwear. Due to our close working relationship with London software developers the focus this year will also be, focused on developing digital communication strategies to deliver tangible education solutions for our clients and social media followers ?that reflect todays society. Continued partnerships with fellow charitable organisations will also continue in 2016 due to the amazing results we achieved collectively in 2015 with audiences over 150 million people globally. Remember all of our latest news is available on our social media pages that are linked to this website. EXCLUSIVE: MS Clear Guide News November 2015 Sourcewire Press Release. I am so excited to share that the '#MSClearguide' is going to be updated in 2016 says author Kaz Aston. After amazing support and feedback since publication in 2012 the free, medically correct, clear guide to Multiple Sclerosis or MS will be updated by creator Kaz Aston and various medical experts. New research findings and lifestyle information to help promote healthy living and disease management will be integrated into the new clear guide. This approach, guide creator Kaz Aston feels can be so helpful to answer questions quickly or find the right people that can provide advice and information. Kaz Aston and fellow medical editors are so pleased that the MS Clear guide has also been reproduced after published in 2013 by many other global MS Charities and still is. Therefore, the purpose of the MS clear guide has definitely been achieved over the last three years says author Kaz Aston. 2015 has been an amazing year for the #MSClearguide because the guide has also been shared at the, 2015 'World MS Patient Conference', various global medical events with pharmaceutical companies and with many community organisations like Rotary in London, UK, in both hard copy print magazines or journals. Further evidence and research to help people affected by multiple sclerosis (MS) is important to share to send out a message of hope for now and the future. 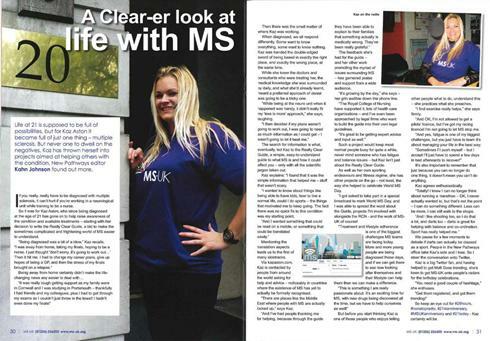 Additionally, the online presence with websites or social media channels continues to grow for MS clear guide. Recent social media campaigns have generated public engagement of between twenty and fifty million people that often generates trending topics on Twitter. Thanks everyone for all of your amazing continued help & support.